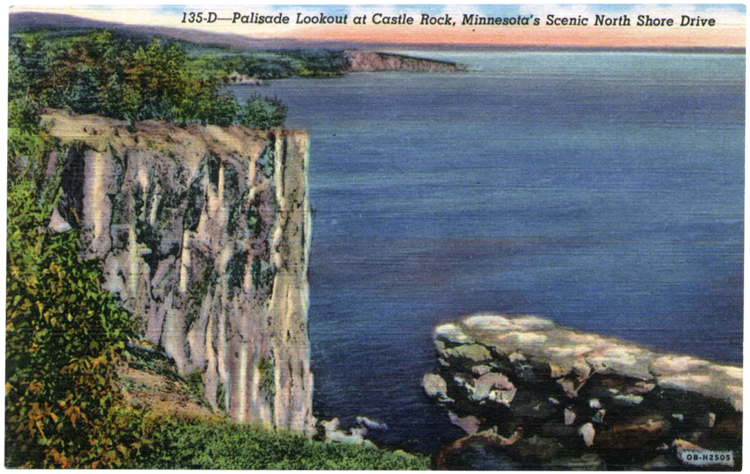 Palisade Head, a cliff that climbs 348 feet above Lake Superior near the mouth of Palisade Creek, stands four miles up the shore from Silver Bay. (Silver Bay was created in 1954 by the Reserve Mining Company for workers at its taconite processing plant.) This eighty-acre precipice, formed by ancient volcanic activity, provides one of the most spectacular views of the lake and its shoreline. On clear days visitors can see the Apostle Islands, thirty miles away off Wisconsin’s south shore, as well as the Sawtooth Mountains up along the shore and nearby Shovel Point—sometimes called “Little Palisades”— which rises 180 feet above the big lake. Both Shovel Point and Palisade Head are part of Tettegouche State Park, which takes its name from the old Alger-Smith logging camp established in 1898 by eastern Canadians near Mic Mak Lake (named for an Algonquian Indian tribe from New Brunswick, Nova Scotia). Today the sheer face of Palisade—igneous rhyolite overlaying soft basalt that has been undercut by Lake Superior’s waves—provides perfect conditions for rock climbers who are brave enough to ascend it.